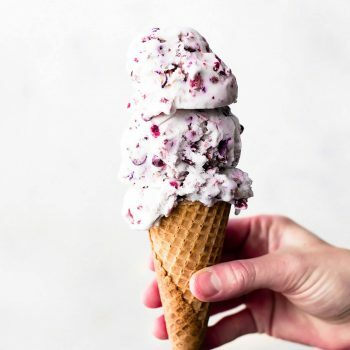 No machine required for this silky smooth mixed berry ice cream! Combine berries in a blender or food processor. Pulse until pureed. In a large bowl, whip heavy cream until fluffy. Add half & half, vanilla, and vanilla pudding mix and mix until smooth. Mix in berries until incorporated. Transfer mixture to 2-3 shallow containers (bread pans work), cover and freeze 8 hours or overnight. Serve with berry syrup if desired.